Broadband – Cable or Wireless? The Mendocino Coast Broadband Alliance (MCBA) President Shirley Freriks recently submitted an article to the Fort Bragg Advocate News to discuss the topic of Cable or Wireless for home broadband connections. The Broadband Alliance Technology Chair, Brian Churm, included a “tutorial” presentation on Fixed Wireless technologies for general education at our Public Outreach meeting on April 3rd, 2015. The notes from that tutorial are posted below. Wireless networks may appear to be magical, but are actually driving investment in fiber optic wires. This resource defines many terms, key points, common speeds, and offers insight into wireless technology and policy. Source: Institute for Local Self-Reliance. You can improve performance and profit with high speed Internet. Today’s business is 24/7 via website and Smartphone. Gone are the days of “Sorry, we are closed”. Compete successfully for future sales growth using the online resources younger customers want and expect as their way to do business and communicate 24/7. By end 2011, an estimated 50% of the US population will use Smartphones. A recent study shows that already 27% of mobile subscribers are not going to physical stores. Increase efficiency and profit with cost and time savings on overhead, administrative tasks, and physical space with off-site personnel who can work from home. Save advertising dollars, increase marketing power, and target audience more effectively with exciting websites and social media networking, even to attract local customers. Meet expectations of vendors, government agencies, and customers who demand communication online. Improve customer relations with the ability to get direct feedback and respond quickly. Save money, time and gas with online meetings through streaming, Skype, VOIP. To provide affordable universal broadband access to homes and businesses to support economic viability, ensure health and safety, offer access to educational opportunities, attract new home buyers, and keep our kids in our communities. To facilitate the building of a county-wide connectivity network to accommodate escalating future technology needs to replace the disappearing land line and dial up options. Invest in the future growth of your business, your community, and the County by partnering with the Alliance to offer knowledge, time, and other contributions. [dropcap3]1. [/dropcap3] Get Involved! Offer your expertise for the steering committee and sub-committees – be a regional representative for your community. Contact us to find out more. [dropcap3]2. [/dropcap3] Become a Leadership Member and Supporter. Contact us to find out more. [dropcap3]3. [/dropcap3] Consider a Tax-deductable Donation. BAMC is a volunteer effort; personal, business, and organization donations welcome. Donations are made through the Community Foundation of Mendocino County. DSL: DSL is a technology provided over your existing telephone lines. It is only available in a 2-3 mile radius from a point where AT&T or other carrier has deployed the service. Check with your local provider to see if your phone system has been upgraded to DSL. MCN offers this service to some locales on the coast and their website is: www.mcn.org. DSL speeds and prices vary from 384kbps to 3Mbps depending on the availability, package selected, and distance from the central office. Surfing the web and checking email can be done with 384kbps. For viewing videos or playing games online plus access to new services like NetFlix online one needs the higher rates. A few communities (Ukiah & Willits) in our county are already receiving a new upgraded version of DSL called ADSL2+ which is broadband quality and will reach speeds of 20Mbps. WIRELESS: There are various companies within Mendocino County who can provide “direct wireless” which is residential and business DSL without the copper wires required for landline DSL. This can be done using a variety of antennas aimed at the service provider’s node on select hilltops which relay the signal. Technologies used are WiFi, WiMax, proprietary 900Mghz radios and even microwave antennas. Wireless solutions are typically more costly than landline DSL or Cable Modems, but provide similar performance for those who happen to be out of reach or not yet serviced by a major carrier. CELLULAR MODEMS: Accessing high speed Internet connection through a cellular phone connection is yet another solution. US Cellular, AT&T, T-mobile, and Verizon offer a 3G Internet service in some areas, and other companies may as well. Marginal cell phone reception can be improved significantly by amplifiers and larger antennas designed to support cellular technology. Local offices will offer equipment recommendations and let you test to find out if there is enough signal strength for data access before needing to make the investment. There are also individuals and businesses in the area that specialize in providing cellular connections to homes & businesses. Look at the Using Your Cell Phone for Broadband in your Home page to get the particulars on how to do this from one person who did it successfully. SATELLITE: Access to the Internet via satellite is another solution available if there is a clear view of the southern horizon where the satellite is. It does have a latency issue which means there is a delay in accessing information due to its travel 46,000 miles up and down to the satellite. This is typically less than one second and acceptable to most people browsing the Internet. Satellite is still advertised as 10 times faster than dial up even though it is not up to the National Broadband Plan standards. Satellite is traditionally somewhat pricey so one word of caution is to check on satellite caps or limits on how much can be used in a day. Heavy Internet users can incur significant cost penalties if they go over the limit so read the terms and conditions carefully. The Broadband Alliance is offering these ideas to ease the pain of dial up for the short term with no guarantee that anything will work for an individual location but it is a place to start. 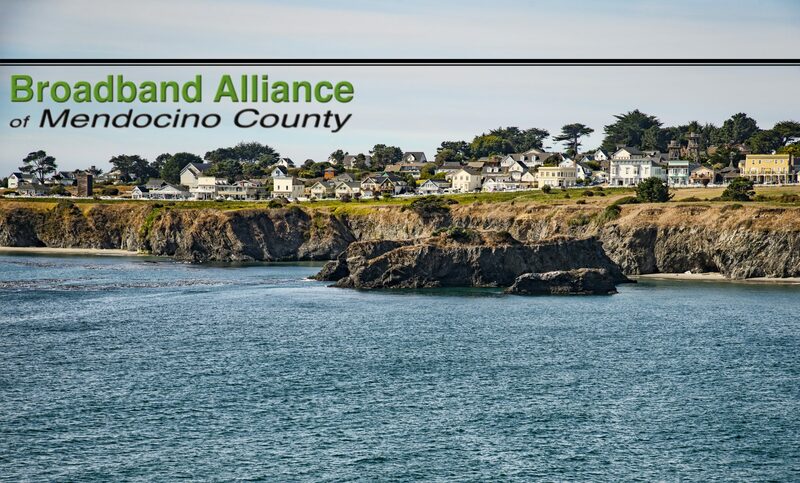 Please contact the Alliance at info@mendocinobroadband.org if you want to help the county-wide effort or if you are thinking of starting something locally in order to coordinate local and county efforts for mutual benefit. Broadband cellphone Internet set up – Offered by a willing party and not an official BAMC document. This is for Verizon but can be adapted to your carrier. – There are NO cell phone minutes associated with a data plan. The data plan and associated modem is independent of time (minutes) but instead works on a data limit (5 GB for 59.99/month). You can be connected to the Internet night and day but if you don’t download/upload anything you won’t move towards your data cap. After you exceed 5 GB per month there is a per Mb fee. I wanted to share our experiences with Verizon Wireless High Speed Internet Service in Alpine Peaks (Tahoe Area) . Last year when we moved to the neighborhood we explored options and weren’t thrilled about the cost, long term contract and variable speed of satellite options so we created a solution using Verizon’s EVDO data service. We do not get Verizon cellphone reception at our home and the modem does not work “as is” but with a simple antenna we are able to tie a modem into the tower above Tahoe City and boost the signal despite the fact that we have no line of sight to the tower. 1. No contract – it is month to month via Verizon if you procure your own modem. 2. Higher speed than satellite and no slowdown during peak times. We get 1.5 Mb/sec downstream and 0.6 Mb/sec upstream regardless of time of day or weather conditions (storms included). Latency is so low that we routinely do video conferencing from our setup without problems. 3. Low fixed up-front cost for equipment. 1. 5Gb per month limit – still pretty generous, even for our heavy usage. 2. A hour or two of legwork to procure equipment and install. Everything you need to know about getting Verizon EVDO data service can be found at http://3gstore.com. I will outline below what we learned and executed to make the service work. The basic equipment setup to make this work costs around $140. You own the equipment. The optional wireless router to convert this from a single computer account to whole home wireless solution costs an additional $85. I would be happy to test your location with my equipment before you make the investment if you are serious about pursuing this Internet option. Also feel free to contact me with questions. include the Verizon USB720, USB727, USB760, UM150, UM175, UMW190. There isn’t a speed difference between these modems. You might want to purchase your modem used on ebay or craigslist. This enables you to get month to month Verizon service instead of signing a two year contract with Verizon which includes a modem for a nominal fee of $20-$50. I bought a used USB720 on ebay for $24 including shipping. Antenna: There are several antennas available for use with these modems. I suggest using a directional Yagi antenna in Alpine Peaks to grab the signal originating from the Verizon tower towards Tahoe City (No line of Sight required!). I purchased my antenna here: http://3gstore.com/index.php?main_page=product_info&cPath=98&products_id=853. Connecting Antenna to Modem: You will need an adapter ($13) and may need an extension cable ($20 for 10 feet) depending on your mounting solution to connect your antenna to your modem. See the link above to find the correct adapter.